Winter. It’s over! Thank goodness…I’ve been so OVER the root vegetable salads. Especially Roasted Beet Salad. Root vegetable based salads are quite tasty, don’t get me wrong. However, after six months of darkness, I’m ready to lighten it up a little with a spring salad! 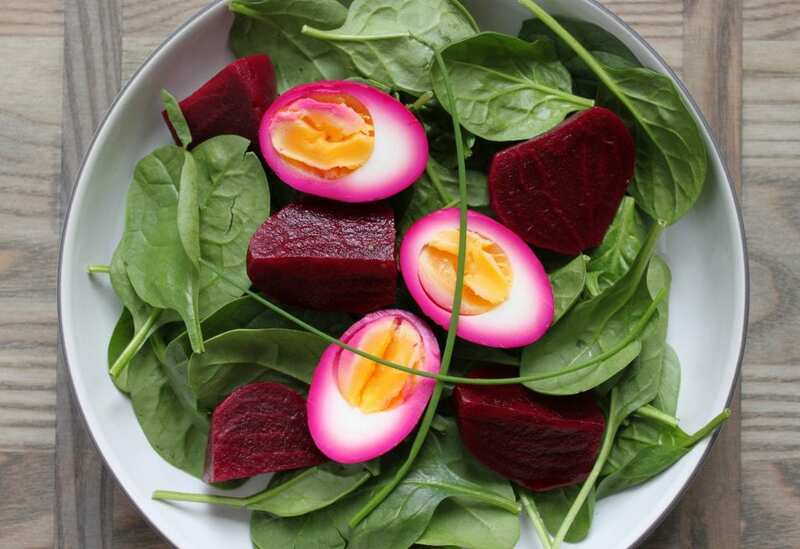 When I was asked to share Easter recipes from ricardocuisine.com I was drawn to the Pickled Egg and Beet Spinach Spring Salad. It was as if the dreary winter had stopped existing, the sun came out and the birds were chirping. Spring is a time for renewal and this is a great way to change up an old favourite! 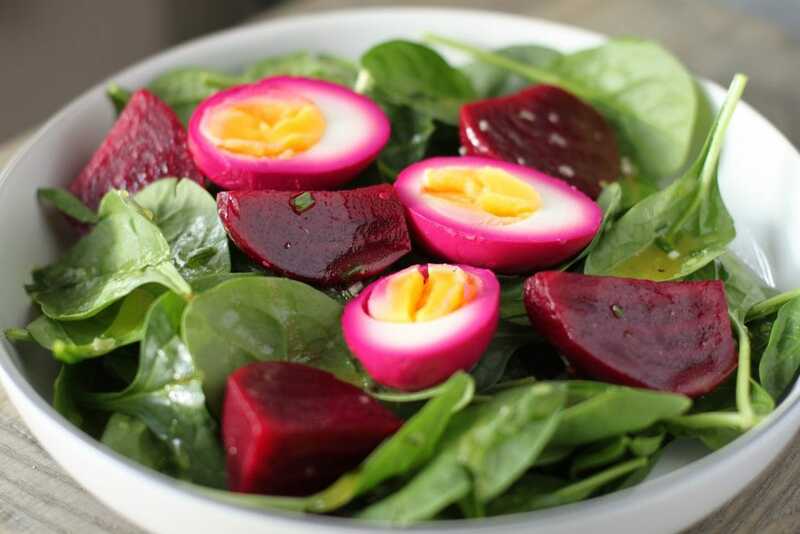 The addition of these lovely, bright pickled eggs to the old beet and spinach salad really makes me smile. I love regular pickled eggs, but I think I will be pickling them with beets from now on. Not only do they look really cute and are dyed the perfect pink, but they taste fabulous too! 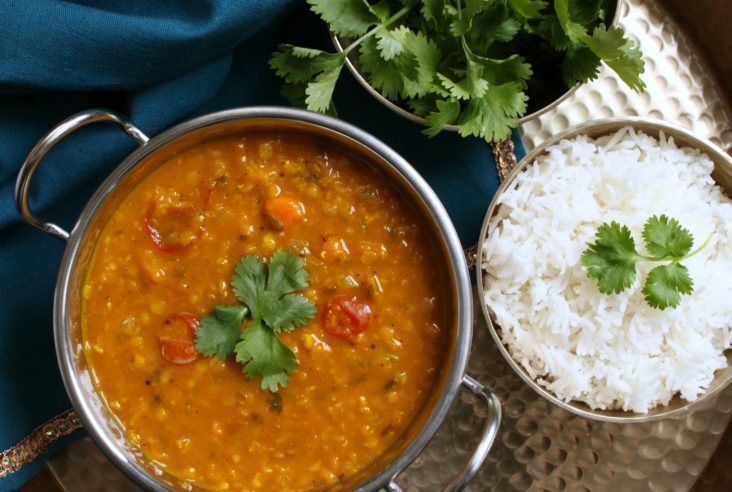 The recipe is certainly not difficult but you do have to make it a day ahead of time. 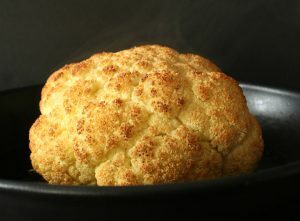 This makes it a perfect ‘make ahead’ dish for your Easter feast. It really comes together quickly after the initial pickling process. When you’re hosting dinner for the whole family, any recipe made ahead of time is a winner! As you can see from the photo above there is quite a large ring of beet dye around the eggs. I had the eggs and beets pickling for about 28 hours. Less pickling time would give you a thinner ring of pink. Flavour-wise the beets were spot on. They weren’t as pickled as the ones you can buy from the store (which are actually too harsh for me) and you can still taste their earthy beet flavour clearly. While making the salad I didn’t follow the vinaigrette recipe to the letter because I didn’t have any white wine vinegar. I substituted a white balsamic reduction and omitted the honey because the reduction was already quite sweet. I also used tarragon infused dijon mustard in place of regular dijon which turned out to really complement the pickling spices that I had used to pickle the beets. Have you ever regretted only making half a recipe? Talk about food regrets…next time I’m making the full recipe. The eggs are outstanding on their own and everyone try a half before I put the salad together. I was a bit worried there would be none left to photograph! 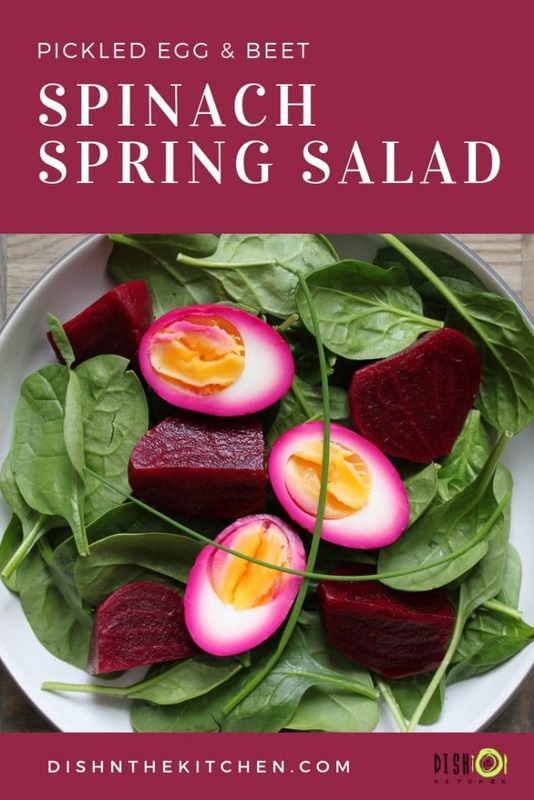 A visually appealing and delicious salad to serve in the Spring. In a large pot, cook the beets in water for about 30 minutes or until tender. Cool them in cold water and peel. Transfer to a 2 litres (8 cups) jar. In a saucepan, place the eggs and cover with cold water. Bring to a boil over high heat. When the water begins to boil, cover and remove from the heat. Let stand for 12 minutes. Place the eggs in very cold water to stop the cooking. Peel the eggs and place them in the jar with the beets. In a saucepan, bring the vinegar, water, sugar, salt, and spices to a boil. Pour into the jar over the beets and eggs. Let cool and refrigerate for 24 hours. Cut the eggs in half to enjoy the colour contrast. Divide the spinach among four plates. Garnish with eggs and beets. Drizzle with the vinaigrette. Adjust the seasoning. I love this kind of salad, in that in between time between root vegetable season and full on spring vegetables. And aren’t there an awfully good selection of recipes in the Ricardo Easter collection? oh my gosh YES! we just had the maple glazed pork tenderloin tonight…another winner! Oh my goodness, that’s a pretty salad! I can only eat very small amounts of eggs (I have a food sensitivity), but I might be tempted to try this. 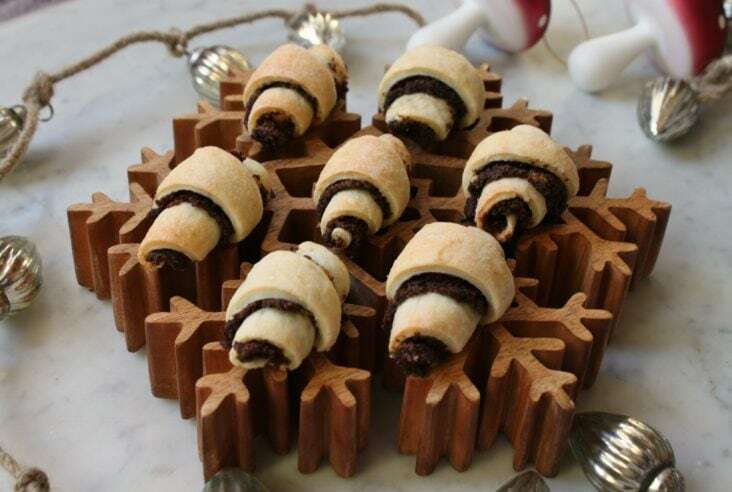 Wow – looks wonderful – love this idea! Thank you Keith 🙂 I don’t know how you can even look at food after all that testing you are doing, HA! Yes – bizarrely it is hard work! I gave my stomach a rest for a day! 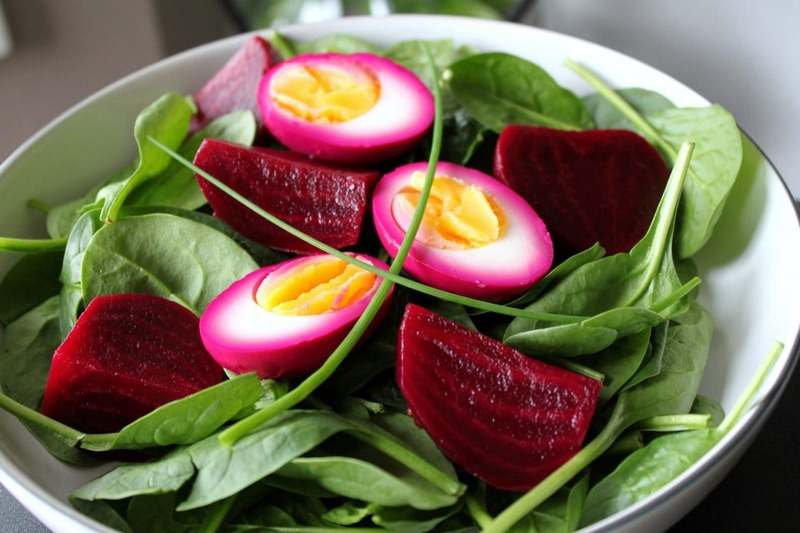 These eggs are gorgeous and look so pretty alongside the beets in a salad. A great dish for Easter! Thank you Jennifer 🙂 We ate the rest of the eggs last night…they weren’t as nice because they were solid fuschia! I never tire of the root… vegetable. I do get a bit tired of beetroot and other root veg in the winter. When you live in Canada, the winters are long and fresh local produce is very limited. Root veggies are all that’s left at the farmer’s markets right now. The tasteless fruit and veg that gets shipped in from around the world is expensive and poor tasting. I can certifiably say I never get sick of beets. And any pickle flavour with them = good by me. It brings back memories of family dinners and the giant pickle platter my Grandma would always leave out. This salad just screams SPRING Bernice. I’ll take two bowl fulls please. Thank you Alex, enjoy and please do let me know how it went! Oh my god how did i miss this post? These eggs are amazing!!! I have never even heard of pickled eggs but the pink is just too cute.